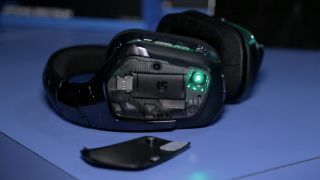 Logitech has two new headsets on show at PAX Prime, the wired Artemis Spectrum G633 and the wireless G933, both of which feature its new 'Pro-G' audio drivers, which the company claims offer "audiophile-like performance." In the video above, I talk with Doug Sharp, Logitech's global product marketing manager of gaming audio (whew), about that claim and the headsets' other features, which Wes also wrote about in detail a few days ago. Only a small number of the new sets are on sale at PAX, but they'll releasing wide soon. The wired G633 launches in mid-to-late September for $150, and the wireless G933 is out in October for $200.